Even the best investors make mistakes from time to time. It's what they learn from those mistakes that's important. Warren Buffett, head of conglomerate Berkshire Hathaway (NYSE:BRK-B) (NYSE:BRK-A) is well-known for his talent of picking winning long-term investments, but that doesn't mean that he gets it right all the time. In fact, Buffett has made a few mistakes over the years that have cost his company billions. He shared the story of one particularly large error he made, and how it helped set Berkshire on the right path for years to come. Two years after GEICO became a wholly owned subsidiary of Berkshire Hathaway, the company decided to expand its insurance operations further with the acquisition of General Reinsurance, better known as General Re. Now, the problem isn't that Buffett regrets acquiring General Re. Quite the opposite, actually. In his latest letter to shareholders, Buffett called General Re a "fine insurance operation that we prize" and attributed its success, in part, to its fantastic management. As of 2016, General Re has a float size of about $17.7 billion and earned an underwriting profit of $190 million in addition to what Berkshire earned from investing the float. In a nutshell, General Re has become a major part of Berkshire's insurance operation, which Buffett calls "our most important sector. Rather, the problem was how Buffett chose to acquire General Re. As is not uncommon to do, Berkshire acquired General Re in a stock deal, where Berkshire issues 272,200 new shares to pay for the purchase. At first glance, this may seem like a fair deal. Based on Berkshire's $58,400 closing price on the date the transaction closed, December 21, 1998, this translates to an acquisition price of $15.9 billion. Knowing Buffett, we can assume he thought this dollar amount was fair. However, fast-forward a little over 18 years later, and the shares Berkshire issued to General Re's former shareholders are now worth $69.4 billion. In a nutshell, Buffett "caused Berkshire shareholders to give far more than they received." What's more, it caused Berkshire's outstanding share count to jump by nearly 22%. Buffett realized his error soon after, and learned a valuable lesson. When possible, acquire your assets in cash. By doing so, you know exactly the price you'll pay. For example, if Berkshire had simply paid $15.9 billion in cash for General Re, that would have been the permanent cost of that acquisition -- not almost $70 billion. Even if you adjust for inflation, Berkshire would have paid about $23.7 billion, a far cry from the true cost. Continuing to build its insurance operation. Energetically acquiring large and diversified non-insurance businesses. Largely making our deals from internally generated cash. Buffett even went so far as to modify that last point to an "always" for the present day, saying that he would "rather prep for a colonoscopy than issue Berkshire shares." And with an $86 billion stockpile of cash as of the end of 2016, and more of it quickly flowing in, this shouldn't be too hard to do. 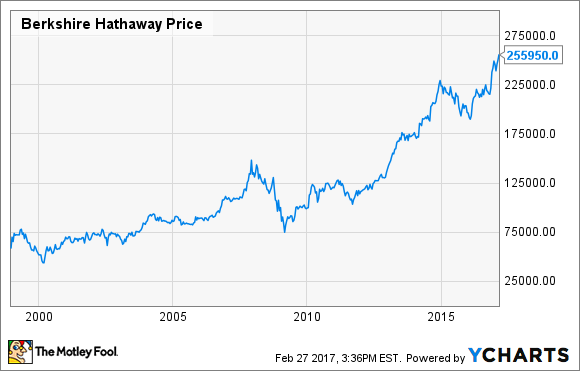 These days, Berkshire Hathaway thrives by using cash generated from its dozens of subsidiaries and stock investments to make further value-adding purchases. Berkshire is like owning a well-diversified and smartly managed investment portfolio in just one stock, and those characteristics should be amplified even more as time goes on.